At 54 degrees and 48 minutes South, Ushuaia claims to be the most southerly city in the world and the tourism industry makes much of their "end of the world" status. 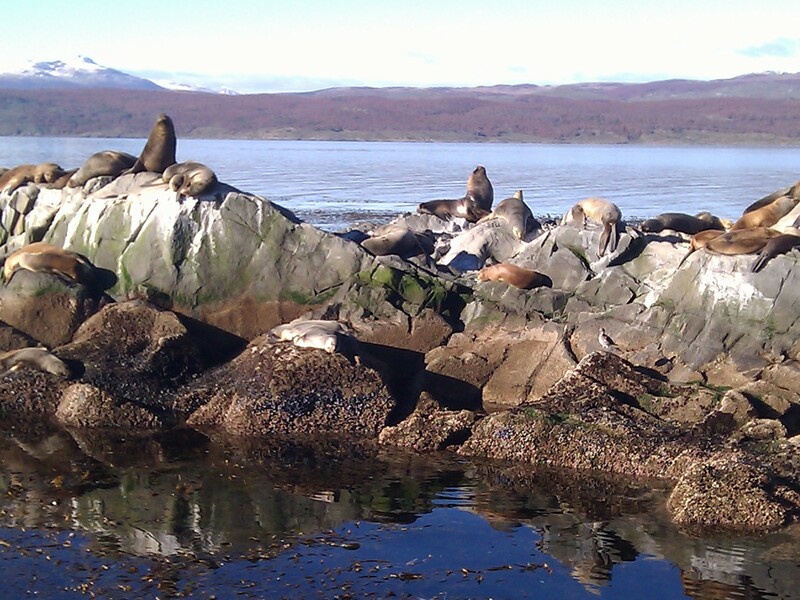 Two action packed days here included sea lion watching in the Beagle Channel, walking up to the Martial Glacier and hiking through Tierra Del Fuego National Park after a ride on El Tren Del Fin Del Mundo. The Beagle Channel is one of three sea routes between the Atlantic and Pacific Oceans at the very bottom of South America. I took a two hour sightseeing boat trip out into the channel. As Ushuaia faded into the distance, I had yet another stunning mountain view behind the boat, with a sharply defined snowline and the now ubiqitous oranges and yellows of the lenga trees covering the lower mountain slopes. 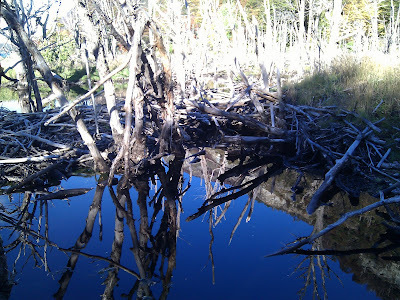 We soon reached a sea lion and king cormorant colony. 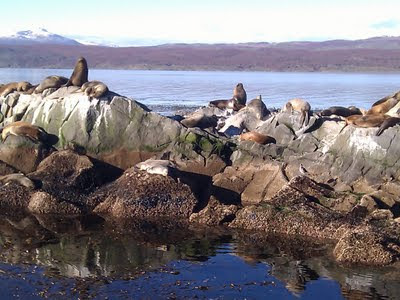 These creatures appeared to coexist happily on their small rocky island, the cormorants quiet and the sea lions honking away noisily. According to our guide, the weather was unusually good for the Beagle Channel, with sunshine, little wind and flat, dark water. The visibility below was exceptional and giant kelp was clearly visible growing up from the bottom, several metres below. Gulls raced alongside the boat, flying just above the water level, and we saw sea lions playing on the surface. The trip included a brief stop on one of the Bridges Islands for a short walk to enjoy the view and hear more about the area from out guide. I recommend this trip if the weather is good. There were many tour operators to choose from, all offering similar trips. Ushuaia is the furthest South I have ever been and I'm sorry to say that I didn't brave the cold or the steep hills of thw town to run here. To compensate, I took a quick afternoon walk straight out of Ushuaia, first by road then a straight trail that cut across many hairpin bends as the road looped back and forth up the valley. At the end of the road I continued past a chairlift and up a ski slope. This started off muddy and quickly became snowy. The views back down across the valley and the Beagle Channel were well worth the walk. 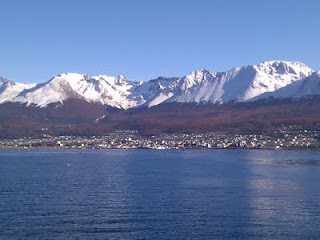 Easily reached from Ushuaia is Tierra Del Fuego (the Land of Fire) National Park. I took a minibus the few kilometres from town to El Tren Del Fin Del Mundo (the train at the end of the world). The train was forgettable and expensive at AR$110 one way for an hour long ride. It is very slow and similar views are available everywhere in the park. A little history was provided on speakers on the train but the same information is easily available at the terminus. Next time, I would skip the train and just get the bus all the way into the park. Park entrance is another AR$85. With high expectations after recently trekking in Torres Del Paine National Park, Tierra Del Fuego did not disappoint, continuing to satisfy my demand for mountains, lakes and wildlife. I started with a 2hr30min walk along the shore of Lapataia Bay, from the end of the train ride to the visitor centre in the middle of the park. It was hard to find a good trail map but the paper copy I eventually obtained was basic but did show the main trails. Despite bitter cold and a bleak, grey sky, this was a real day for wildlife. To start, I saw seals playing just off shore. Walking along the edge of the Bay, the trail crossed several small beaches of green rock and stones, interspersed with silent, tranquil woodland. The path itself consisted of dark soil, muddy in places and with many tree roots and would have made a great running trail. It was mostly flat with a few short, steep sections towards the end. I saw nobody else on trail until I reached the visitor centre. Caracaras were a regular feature on the trail and could be approached to within a few metres before flying or hopping away. These birds of prey look a bit like black and white chickens, with a large head and hooked beak. Light rain threatened to spoil the walk for a while, but the trees provided shelter. The visitor centre is excellent, in a huge building with many displays on local history and a lookout tower on top of the building for birdwatching or just enjoying the view across the Lapataia River. A red fox stopped by the window, intently following some prey which I never saw. The second half of the walk (another 2 hours) consisted of six interlinked trails across and around the Bay. Water was always visible in lakes or ponds of every size. 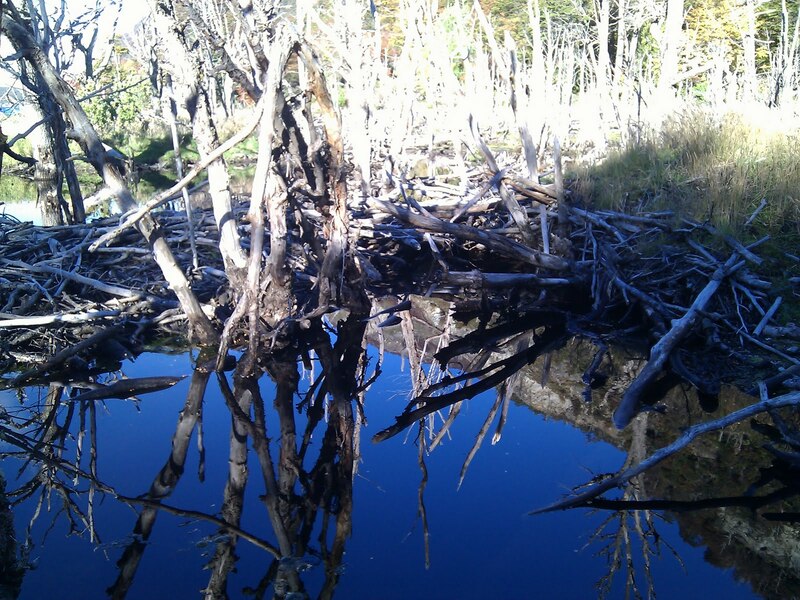 I saw beaver dams, but no beavers, peat bogs and a visually stunning out and back walk along the edge of Lapataia Bay (the Senda De La Baliza trail) where I checked the water temperature with my dive watch (a hand numbing 7 degrees C). 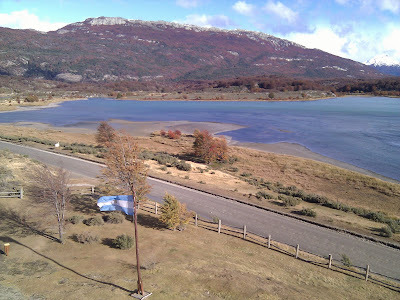 There are several other trails in Tierra Del Fuego National Park and with more time I would have liked to walk to the summit of Cerro Guanaco and along the shore of Lake Roca. In summary. an expensive day (the minibus was another AR$80) but, without the train, well worth it for getting close to so many creatures in such beautiful surroundings.